Despite its relative size, Australian private debt has not experienced the same degree of institutional participation as other markets. According to Preqin data, the total uncalled capital commitments (dry powder) plus the unrealized value of portfolio assets collected by Australian closed-end private debt funds was AUD 1.2bn as at March 2018, which is still significantly smaller than the wider Asia-Pacific region (AUD 53bn). 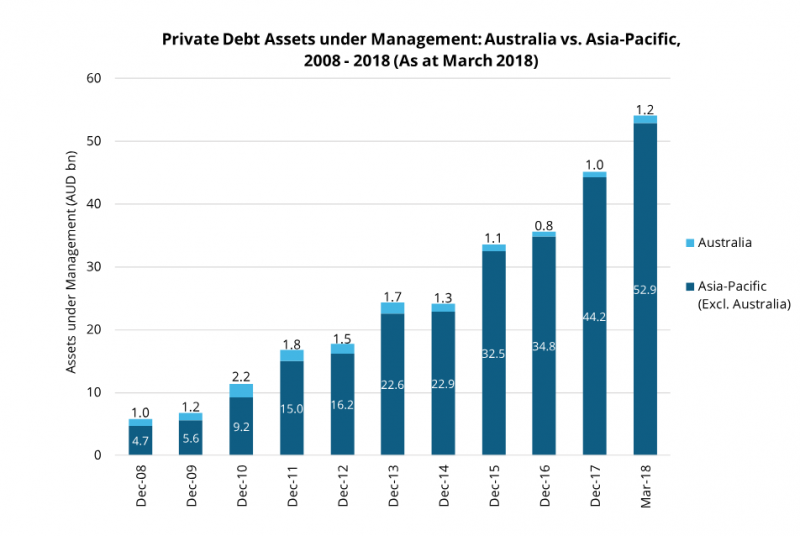 The Australian private debt market has largely been dominated by domestic and, to a lesser extent, offshore banks. Thus far, Australia’s largest banks have traditionally held a significant proportion of the private debt market on their own balance sheets and financed this with a combination of deposits and issuance of their bonds in domestic and global markets. In this way, the private debt market has almost been entirely intermediated by the big four Australian banks, with the only meaningful way for institutional investors to gain exposure to this space being through the purchase of bank-issued bonds – which is an indirect and levered exposure.